The intense and intensely intimate filmmaker inspired many a comic parody over the years. 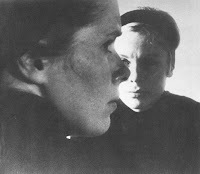 Voice Over: Swedish art film legends Bibi Andersson and Liv Ullmann for Que Tips! Bibi: … You have a lot of wax in your ear. Bibi: …You’ve got a lot of wax in your ear! Liv: …I’m sorry, I can’t hear. The deafening silence of an empty universe has turned me inward. … Plus, I’ve got a lot of wax in my ears. Bibi: … You need to take comfort in love …though it is always fleeting. Bibi: And try some Que Tips. Voice Over: Que Tips. For when you’ve got wax in your ears. Old man dreams fitfully. He is in a deserted town in which the hands on all the clocks have fallen off. A horse-drawn hearse walks by, dumps a coffin, and gallops off. Old man walks up to coffin, looks in, sees self in coffin, who commences to pull him in with him. Cue voice-over: "For God's sake, don't go to sleep at all! Try Provigil."